Lock in a great price for Viejo Lobo – rated 8.3 by recent guests! Everything was special in this hostel. We had nothing to complain! Beach front, staff are very friendly and very nice atmosphere with other hostel guests. Super friendly staff, great location, very familial atmosphere. I highly recommend it! A great, simple and chilled place overall. Lovely staff with a purpose to be more eco-friendly. It's a house that, keeping in mind where It is, fullfill the porpuse, very cozy. Great little room which almost stepped out on to the beach! The hostel staff were amazing. The owner e the staff were very helpful. The place is very original and it’s locate right in front of the truck stop and beside the beach. Set in a charming “rancho” only a 1-minute walk from Norte Beach, Viejo Lobo offers budget accommodations with sea views. It features a fireplace and common kitchen facilities. Cabo Polonio’s Lighthouse is a 15-minute walk away. Decorated with tiled floors, rooms at Viejo Lobo are very bright. All of them have shared bathrooms. Guests can cook their own meals in the common kitchen or enjoy barbecues in the BBQ area. A fireplace is features in the lobby. Excursions can be booked at the tour desk. The Dunes Natural Monument is a 30-minute walk away. Luggage storage is provided. Viejo Lobo is 4.3 mi from Cabo Polonio bus terminal. Sur Beach is a 3-minute walk away. This property also has one of the top-rated locations in Cabo Polonio! Guests are happier about it compared to other properties in the area. This property is also rated for the best value in Cabo Polonio! Guests are getting more for their money when compared to other properties in this city. When would you like to stay at Viejo Lobo? A colorful energetic place, in the center of cabo polonio. Created with the purpose to unite the possibility of tourism with ecological consciousness, we receive all year people from the whole world, in a friendly and familiar atmosphere, where we hope everybody can feel at home and get to know the wonders of this special location in Uruguay. The hostel is also supporting a network of permacultural communities in Uruguay, working for a new vision of the economy as the balance of energy in these places. House Rules Viejo Lobo takes special requests – add in the next step! Viejo Lobo accepts these cards and reserves the right to temporarily hold an amount prior to arrival. Wonderful place with great staff and very good dinner. We highly recommend this hostel! There are only two toilets downstairs for the whole hostel. I knew to expect little in terms of electricity, water, etc since Cabo Polonio is pretty rustic so this wasn't a huge deal. The staff are extremely kind and helpful, especially Walter! 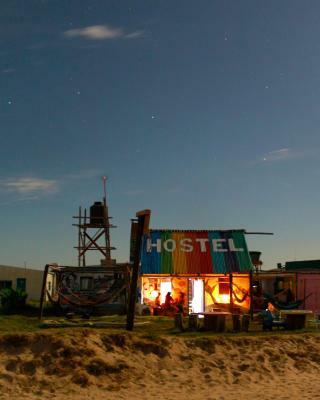 The hostel, which caters especially to traveling artists and photographers is well-located and has a lovely interior look that definitely accentuates Cabo Polonio's hippie vibe. Also, the staff managed to keep everything very clean despite all the sand! It is what it is. A simple and small place with very tiny rooms. Althoug, that was expected. But for me who lives in a similar place, runed on volontery basis back home, the Price took the "hippie" fealing down abit. The space in the dorm is very limited so it was quite packed with 4 people and their gear - but that is the only little downside. I would go back for sure! Great atmosphere and vibe at the Viejo Lobo!! A bit like a small commune. Breakfast and Dinner is extra but definitively worth it! A great place to relax, meet and talk with people and enjoy the nature. I am glad, I stayed there! 7 people under the roof, no space at all. Very minimal space between the bottom and top bunk bed. Kitchen isn’t very inviting. Nevertheless dinner is available. The place is unclean. Bathrooms not suitable for usage, particularle when the flush isn’t working!!! Interesting place for only one night. Nice bomb fire at night. Maybe the bathroom was a little bit small and uncomfortable, but nothing important! Although this is to be expected in Cabo Polonio, the toilets were not working properly, and while it states there is free wifi, that is only true between 7pm to 7am. Great location, welcoming and knowledgable staff and nice patio with hammocks. We also decided to have dinner cooked by the venue, which was tasty and very reasonable priced. The beds were a little short. I'm 6ft 1, the beds were a tiny bit too small for me. Location, staff, meals, vibe. This is a very chilled out spot. If you come here, be prepared to jump into that mindset. Beautiful place in a special village. Good food offering, relaxed vibe and very nice staff. Best location!